Sage, a healing herb, is used to cleanse and purify through the process of burning or "smudging". There is something special about the ritual of smudging and anointing your self, your body or space to make it more sacred. Burning sage is a spiritual practice/discipline that can be utilized by anyone in need of anointing or healing. For me, a Daughter of Light and true Sage Sista, running out of sage is like running out of water. When you overstand that your life is a prayer, you begin to develop and incorporate habits and expressions, which make your journey and life more divine and holy. One such habit that you can begin is the burning of sage. The ritual of burning sage has been used for centuries and is one of the oldest and purest methods available to cleanse, purify, protect, heal and bless. The best herb to use for this purpose is white sage, which drives out any negative thoughts, energies, spirits or negative influences. Sweetgrass can then be used to attract positive energy to aid healing after sage has dissipated all the negative energies. 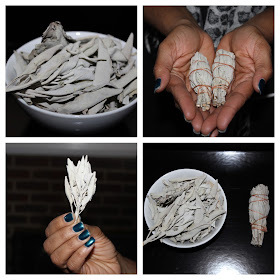 White sage can be purchased as loose leaves, sage bundles or incense sticks. Be certain to burn sage in a heat resistant dish with sand if possible. Smudging rituals can be as elaborate or as simple as you like. It is of the highest importance that your intentions be clear before you begin calling on the spirit of the sage plant to cleanse and protect you, driving away any negativity from your heart. To take away everything unworthy and impure, smudge your whole body from head to toe, front and back, waving the smoke over yourself including limbs. Breathe in the heavenly aroma visualizing the smoke purifying your body from within. Check Soul Sessions for an in-depth instructional post on sage smudging and purification rituals. Post coming soon! For more information, products or consultation contact your Sage Sista at b2gsacredspa@gmail.com or (302) 438-0970. Still, the posts are very short for newbies. May you please prolong them a little from subsequent time? mention that I've really loved surfing around your blog posts. In any case I will be subscribing in your feed and I hope you write again soon! I'm really loving the theme/design of your weblog. Do you ever run into any internet browser compatibility problems? A small number of my blog visitors have complained about my website not operating correctly in Explorer but looks great in Chrome. Do you have any ideas to help fix this problem? This put up actually made my day. You cann't believe simply how so much time I had spent for this information! Thank you! Someone necessarily assist to make seriously articles I'd state. That is the first time I frequented your web page and thus far? I surprised with the research you made to create this particular submit extraordinary. Magnificent job! fantastic. I really like what you've received right here, really like what you are stating and the best way wherein you say it. You are making it entertaining and you still care for to keep it smart. I can not wait to learn far more from you. That is actually a wonderful site. Greetings! Very helpful advice within this post! It's the little changes which will make the largest changes. Thanks a lot for sharing! thought I may as well check things out. I like what I see so now i'm following you. Look forward to looking at your web page for a second time. Can I just say what a comfort to discover a person that genuinely understands what they're discussing on the net. You certainly realize how to bring a problem to light and make it important. More and more people should read this and understand this side of the story. I can't believe you aren't more popular since you most certainly possess the gift. What's up Dear, are you genuinely visiting this website regularly, if so then you will without doubt take nice know-how. Awesome post and it will be give more information those people who such a need. The casters wheel is the important part of every office and home, in the furniture, roller, skating and in many other, casters has very important role.